Brian Krueger is a 2013 graduate of LTHS where he was on the varsity wrestling team for three years. In 2011 he wrestled the 103 pound weight division with the team as they advanced to State. Brian earned a Bachelor of Science degree from Florida State University, where he majored in Criminal Justice and Military Science. He received an Army ROTC scholarship and was a cadet in the ROTC for four years, while earning his degree. Besides his military training at FSU, Brian has trained with the Guyanese South American Defense Force, completing a jungle survival course in the Amazon Rain Forest. He also trained and graduated from cadet training at Fort Knox, Kentucky. 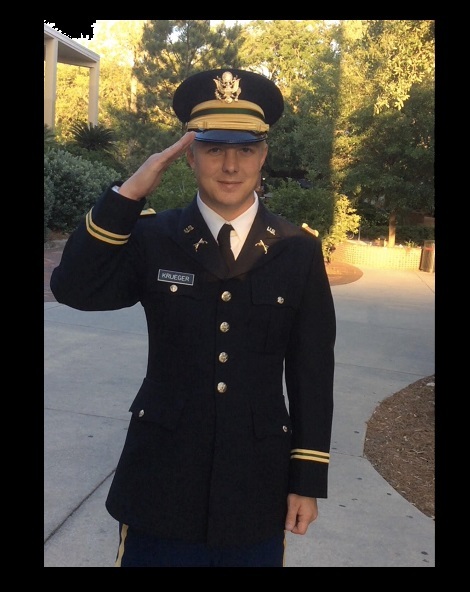 Brian was formally commissioned as a 2nd Lieutenant in the U.S. Army in 2017. He then continued his training in Fort Leonard Wood, Missouri, where he completed an officers’ training course for military police. Brian is currently serving as a reservist at the Army Reserve Base in South Bend, Indiana. His future career goals include obtaining a position with the federal government in the field of criminal justice.